Does not Commute 1.0.0 APK is available so you can download and install it easily to your device. This is free game which is developed by Mediocre. Mediocre is one of the many successful indie developer in mobile games. One of the best-selling game in the mobile market is Smash Hit, recorded in October 2014 to reach 100 million downloads. Mediocre is highly skilled in designing the concept in the manufacture of mobile games, the game mechanics are simple but given a little spice fantastic visuals make the game releases from Mediocre pretty much awaited fans every year. This game is new types of strategic driving genre. Game with unique gameplay and entertaining to play. 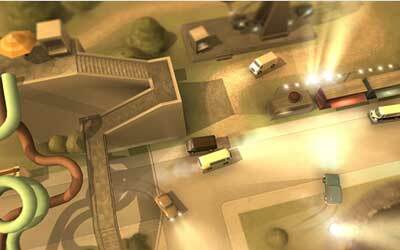 Traffic chaos, speeding down the road, crashing into anything that face is one of the nice things in this game. This game also includes difficult game, because in the game you will be faced with obstacles that you create yourself. In the game you’ll take a variety of citizens to their destination at each stage of the game. Set in place in a small town in 1970, every car in the game has a story, respectively. As Mr.Baker who will quit his job if not rushed to the office, or artisan ice cream named Hernandez who had to go to the grocery store to buy ingredients to make ice cream. The overall storyline created by Simon Flesser. Controls in the Does Not Commute for Android is very simple. To steer the vehicle that you control, you just have to tap the left and right of the screen to turn left and right. But I think the control in this game is arguably bit difficult, sometimes I myself forgot to turn the button to the left or to the right, because sometimes when we launch our new car will be placed at the top of the screen and of course to turn control also be reversed. This is a really fun game. The back stories are hilarious and the action isn’t as easy as it looks. You control every driver in the game and your goal is to get them to their destination. How you control your first driver has an effect on your other drivers. It is an addicting puzzle game.